Rinjani Mountain is located on Lombok Island, Indonesia as part of the Lesser Sunda Islands or Nusa Tenggara Islands or located between Bali Island and Lombok Strait in the west and Sumbawa and Alas Strait in the east is designated as Global Geopark by UNESCO. 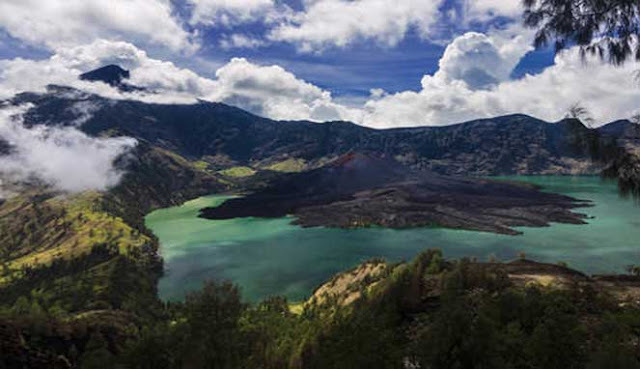 Rinjani National Park Lombok has a rich and diverse landscape, ranging from savanna and rainforest to lowland green forests and tropical green forests. At Rinjani mount, there are volcanic volcanoes, Oligo-Miocene and Neogen intrusive igneous rocks that dominate the island's geology. Volcanic rocks at Rinjani mountain Lombok develops due to subduction of the Indian Ocean Plate under the Southeast Asia Plate. This volcano can be categorized into the old mountain and also young. How high is mount Rinjani? Old volcano complex consists of Mount Punikan and Mount Nangi in the west and Mount Sembalun in the east. The height of mount Rinjani Lombok about 3,726 meters from sea level, Mount Rinjani is the highest mountain on the island. The Samalas mountain caldera filled with a combination of meteoric and hydrothermal water has formed Lake Segara Anak. In the midst of the caldera also appears a young volcanic cone Rombongan mountain and Barujari mountain. The area of mt Rinjani Lombok Indonesia was formed from about 12,000 to 6,000 years ago, two mountain cones have existed before the eruption of Mount Samalas or Mount Rinjani Tua in the 13th century. Samalas Volcano and Mount Rinjani. The eruption of Mount Samalas on the island of Lombok Indonesia occurred in 1257 which resulted in the formation of large caldera and pyroclastic flows in Kokok Putik. This eruption caused the collapse of Mount Rinjani Tua. The eruption also changed the entire landscape, burying old civilizations and creating new cultures. In 2009, Lombok has about 3,142,195 residents. The Lombok Geopark region covers five districts (Kabupaten Lombok Utara, East Lombok, West Lombok, Central Lombok and Mataram). The language used in this region is not only Indonesian but they also use the local language of Sasak language. In Lombok, Sasak has four different dialects. About 80% of Lombok's population is part of the Sasak and Balinese ethnic groups, most of whom are Muslim. Hinduism, Buddhism, and Islam have influenced the history of the Sasak people in Lombok. The Sasak community is multi-ethnic and multicultural and represents cultural acculturation. The process of acculturation can be seen in Lombok Cultural Heritage which is displayed in the old temples or old traditional mosque. Tools of the Paleolithic era such as stone axes used for cutting and farming or Discovery on Mount Plates associated with Shan Huyn Kalanny are also found in this area. Among these findings are fully preserved pots, human bones, shell remnants, charcoal and pieces of metal and animals. Other archaeological finds at Rinjani mountain garden Lombok include the Awalokiteswara Buddha Statue, Nekara, and tombstones with Chinese and Arabic letters. The prehistoric Sasak ancestral settlement occupied the coastal and inland areas. At Rinjani mountain garden there is a Sasak puppet, a traditional puppet play and its unique performances on the island and associated with Sunan Prapen that introduces Islam and Wayang on the island of Lombok.